Use the best calculator photo vault to hide photos, hide pictures, hide videos. Calculator Photo Vault is the Vault app can secretly Hide Photos, Hide Videos and other files without anyone knowing as gallery lock installed in your phone looks as just a beautiful calculator, and works very well. 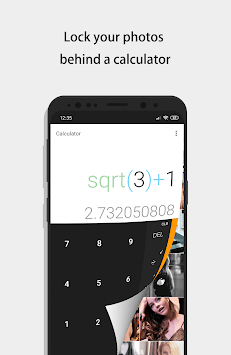 Your files will be secretly stored in vault and can only be viewed after a Numeric PIN is entered on calculator panel of this app. 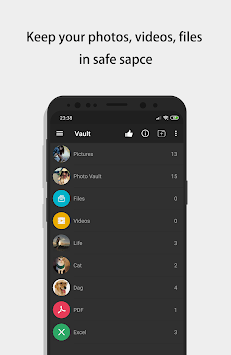 ☆Vault: Through the AES encryption algorithm, encrypt the content that you do not want to share with others, and the file format, size without any restrictions, but also support taking pictures and recording videos. ☆Browser: An inbuilt private browser for your safe browsing of private websites and downloading of photos from web and lock instantly inside photo vault and leaves no tracks in your system. ☆Shake Close: Shake the phone can quickly close the app, so that everything in your control. ☆Intruder Selfie: Automatically takes Intruder selfie when someone tries to break in your privacy by entering wrong password. ☆Fake Vault: Create Fake vault with different password for storing fake photos and videos. ☆Colorful Theme: A variety of fashionable colors, any match, to create your exclusive theme. Enter your password and press '=' button to open. In case you forget your password, simply enter a number '11223344' into Calculator and press '=' button, then retrieve your password by entering answer of your security question. Your files are stored only on your device, so please make sure to backup all your hidden files before transferring to new device or factory reset. Please go to the app's "Settings > Safe > Lock Type" to change the unlock password.